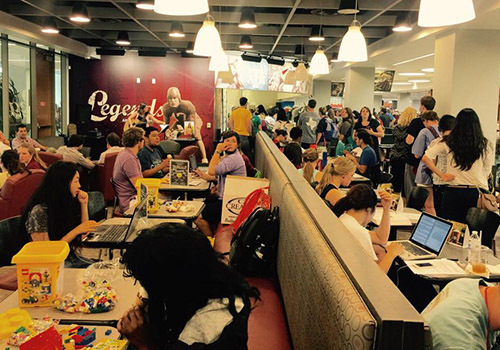 Campus bookstores held De-Stress Fest events throughout the country during final exam week. 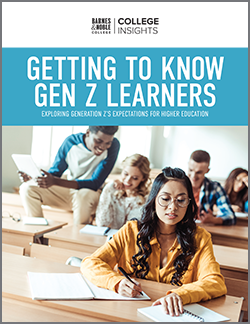 The closing weeks of the school year can be extremely challenging for students, especially with studying for final exams, graduation, and moving out of dormitories and apartments to head home for the summer. 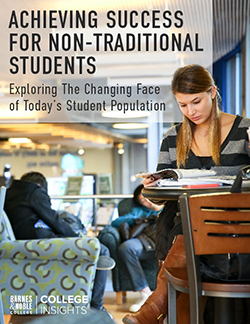 This spring, Barnes & Noble College campus bookstores helped ease that strain with De‐Stress Fest events held nationwide. The events allowed students to take a break from studying and unwind with fun and relaxing activities. The De-Stress Fest events differed on each campus and included chair massages, petting zoos, games, movie night, photo booths, puppies, food and refreshments. 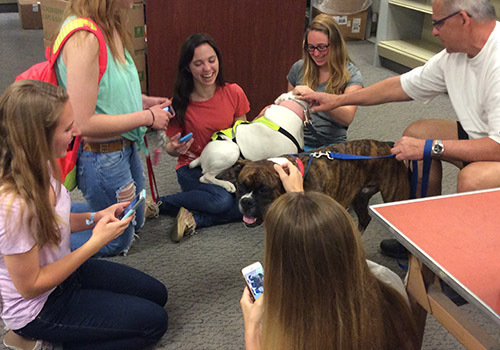 D-Youville College students enjoyed petting dogs that were brought to the Buffalo, N.Y. campus bookstore to ease the stress of finals. The Barnes & Noble at Texas A&M bookstore, located in College Station, TX, was filled with students seeking a break from the stress of final exams. Students could enjoy refreshments, participate in games and other activities at this spring’s De-Stress Fest. 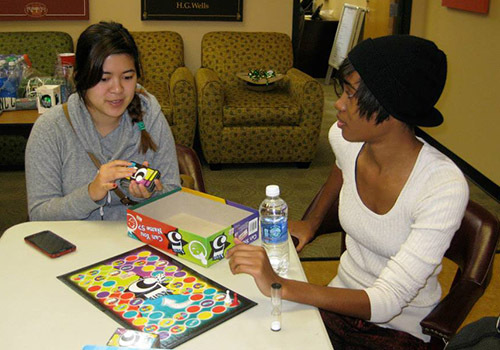 Students from the University of North Carolina at Charlotte unwind by playing a game. 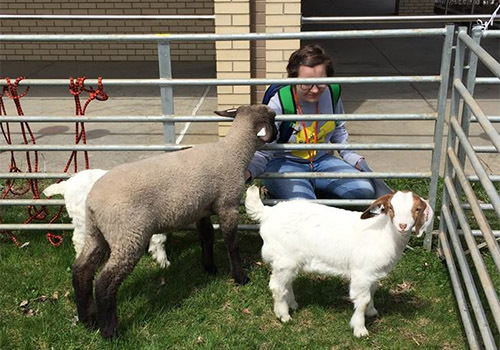 A petting zoo, featuring a variety of animals, was set up outside the SUNY Cobleskill bookstore. 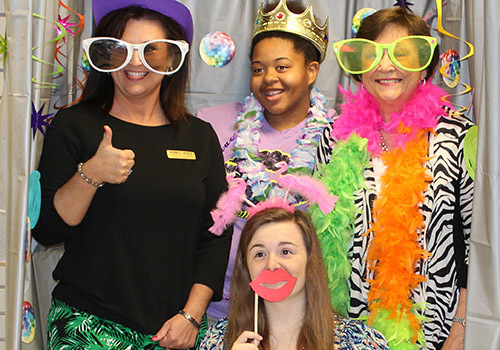 Madisonville Community College students had some fun posing for photos at the spring De-Stress Fest. 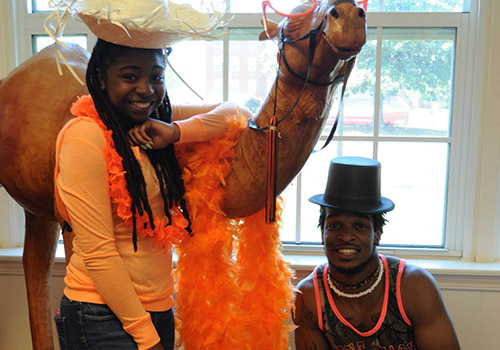 The campus is part of the KCTCS system in Madison, KY.
As part of the Campbell University Bookstore De-Stress Fest, students could also dress up and pose for photos with the school mascot, Gaylord the Camel. Campbell University is located in Buies Creek, NC. 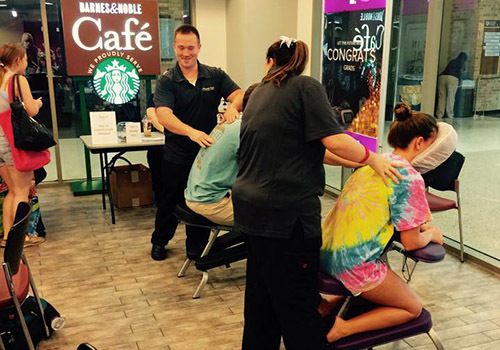 Texas A&M students relieve tension and stress with a quick back massage in the campus bookstore. 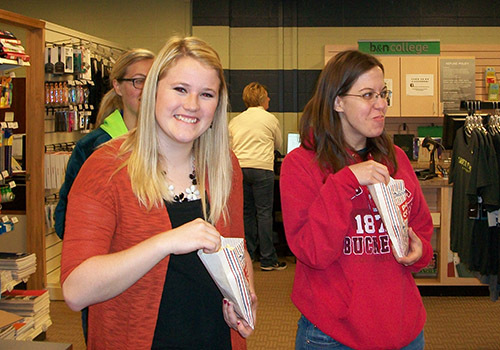 Popcorn and other snacks were handed out to Wright State University students who visited the bookstore during finals week. Wright State University is located in Dayton, Ohio. 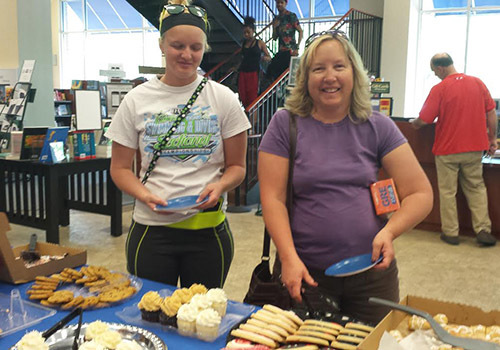 Free refreshments were offered to students at the Indiana State University Bookstore’s De-Stress event.